Base: Pound cake. This is a classic pound cake with a wonderful twist. 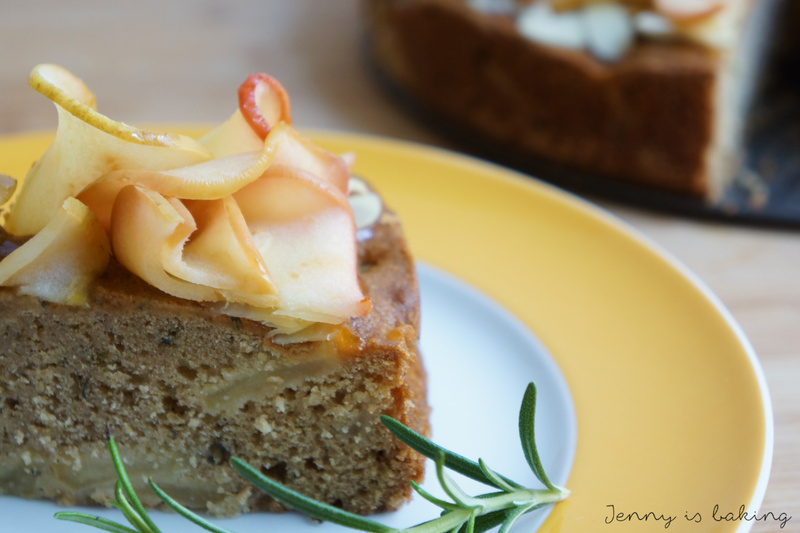 Ever tried the combination apples with rosemary? I hadn’t. It is wonderful! The rosemary flavor really complements the apples. As you simmer the apples and rosemary first with a little bit of butter, you do taste the rosemary, but it is not too dominant. It adds some nice spice. Mid-Section: Once you got the cake out of the oven, you put a thin layer of apricot jam on the top and sprinkle the edges with some almonds to make it look pretty. Another nice layer you can later enjoy. Apple Roses: This is the fun part. In order to get them to really twist and turn, you boil the apple slices in sugar water for about 30 seconds. Once you place them on the cake, you will brush them with apricot jam and bake the whole cake for another 10 minutes. This seals the apple roses so they don’t turn brown, but also helps to caramelize the top layer. Do I need to say anythings else? *The butter has to be at room temperature. Either heat it up a bit in the microwave or place in a warm, sunny place to be sure it has the right consistency. **Put eggs into a bowl with warm water for five minutes if you forgot to take out the eggs on time. 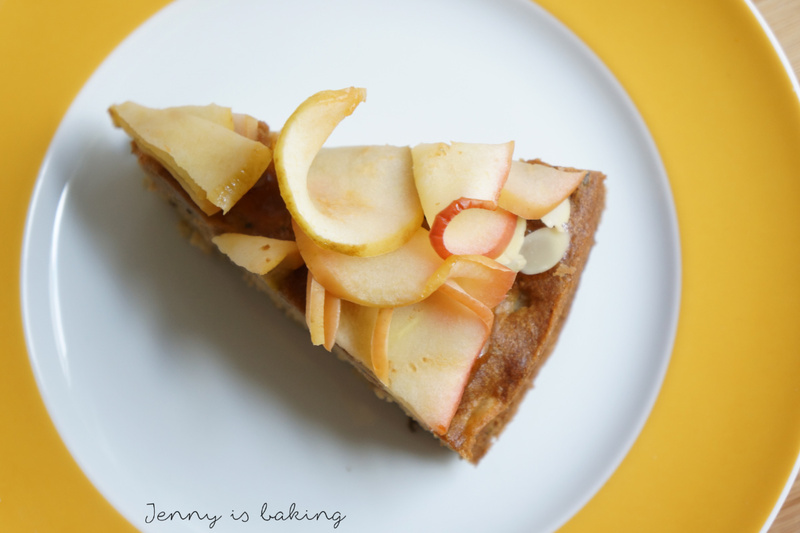 For the pound cake peel the two apples, slice each into 4 pieces, take out core and chop into cubes. Melt butter in a saucepan and simmer apple cubes and rosemary for about 5 minutes with the apple juice. Add sugar and let simmer for about 1-2 minutes, set aside. Meanwhile prepare all other ingredients and butter and flour a springform of ∅ 24cm. Preheat oven to 150 degrees Celsius. In a large bowl cream the butter with a mixer until fluffy, then add the brown sugar. Once very creamy, add molasses. Mix in eggs, one at a time. Sift the flour, baking soda, baking powder and salt on top of the butter mix. Mix slowly with a mixer. Add the sour cream and mix until you have a heavy and creamy batter with no lumps. Fold in the apple rosemary mix with a wooden spoon. Pour into the springform and bake on middle rack for about an hour. Inserted toothpick should come out clean. Take cake out of the oven and spread a thin layer of heated-up apricot jam on top with either a spoon or a brush, about 1 tablespoon. Place the almonds around the edges. For the apple roses slice all 6 apples into 2mm slices (I used my bread cutting machine), don't use the apple core, but stop shortly before you reach the center. This means you will slice each apple from two sides and have the core left to throw away. Bring one liter of water with 200 grams of sugar to boil. Stir so that sugar dissolves. Put in all apple slices at once and wait until water boils again. Take apple slices out and drain. Set aside to cool off a bit. 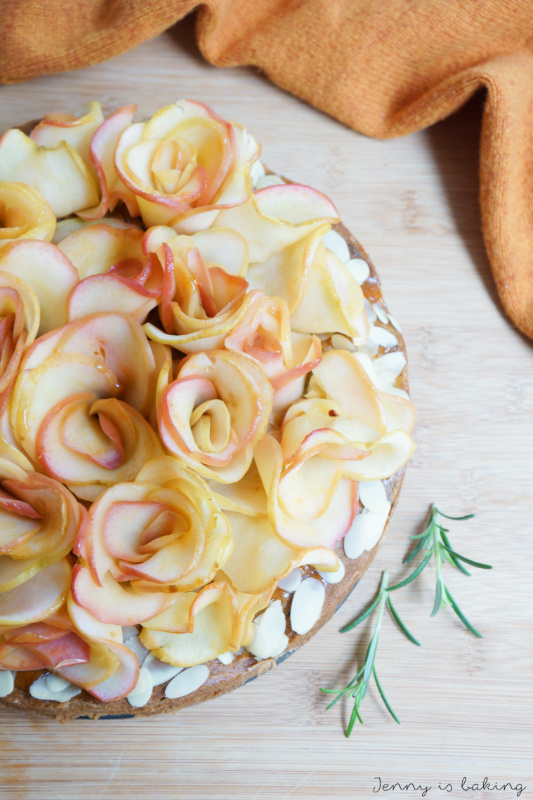 To make the apple roses always start with a small slice and roll up. Place another slice around. For each apple rose you will need about 4-6 apple slices. Always start with smaller slices and keep the biggest slices for the outer part of the rose. Make a small cut of about 1 cm in the center of the cake. Place the first apple rose into this cut and work your way to the edges of the cake, making small cuts for each apple rose. Once done, brush the apple roses with about 1 tablespoon of heated-up apricot jam and bake for 10 minutes at 180 degrees on middle rack. This will help for the apple roses not to turn brown, but also to caramalize the jam. The key to making a pound cake is to have all ingredients at room temperature, especially the butter and eggs. Pound cake means to mix ingredients thoroughly. Especially when you prepare the butter part, take your time before you add new ingredients and make sure there are never any lumps seen. Yes, you can only make the pound cake. Also very delicious without apple roses. The apple roses are not that hard to make. You just need to be sure that you can twist the apple slices the way you want. Boiling the apple slices for a bit in sugar water really does the trick, it should not be hard to create the roses. Make sure you make the apple slices thin enough, 2 mm is about perfect. This cake tastes even better on the second or third day. Keep in the fridge for 5 days. 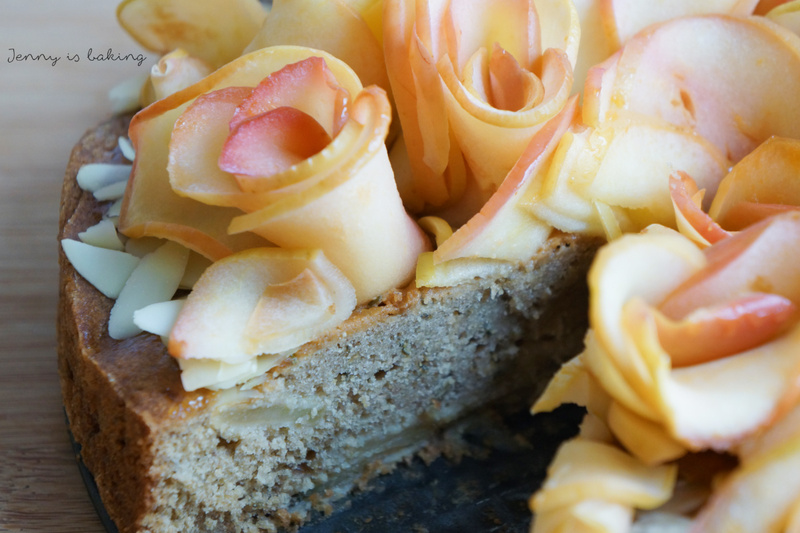 It is very easy to make the pound cake (you can even freeze it) in advance and make the apple roses another time. Thank you, just the pound cake itself is delicious, I really love the hint of rosemary! Thank you! 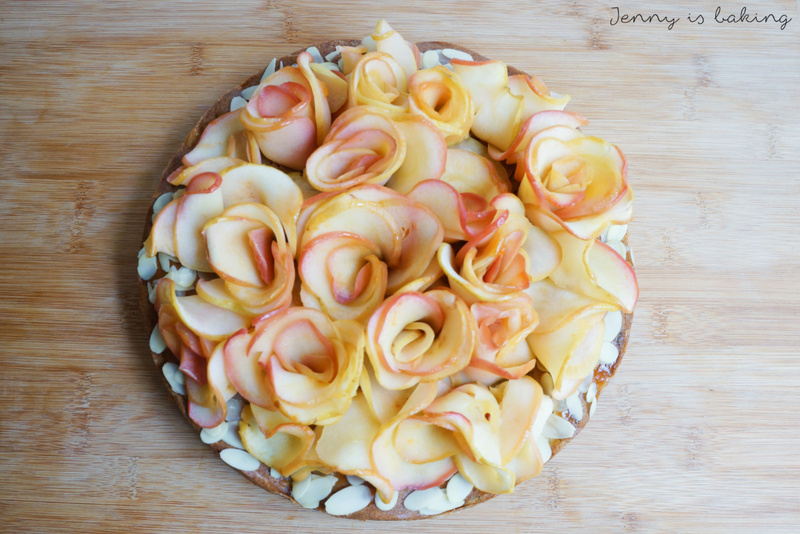 You can make the cake first, freeze it and make the apple roses another time. They do take some time, I think about half an hour or so. Yeah, I may register for Pinterest, I’ll see… Sorry, but for now I guess you have to bookmark. I think so. It is really pretty and tastes awesome! Oh how pretty! This look amazing. Thank you, was a lot of fun! 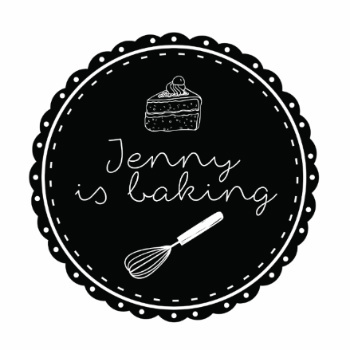 Jenny, this is absolutely stunning!! I cannot even begin to imagine how much work went into this cake (and the subsequent photo shoot, ha ha), but it is beyond beautiful! You have created a work of art!! Thank you so much, that’s kind of you to say. Yes, it is a lot of work. That’s why I only make it on very special occasions. 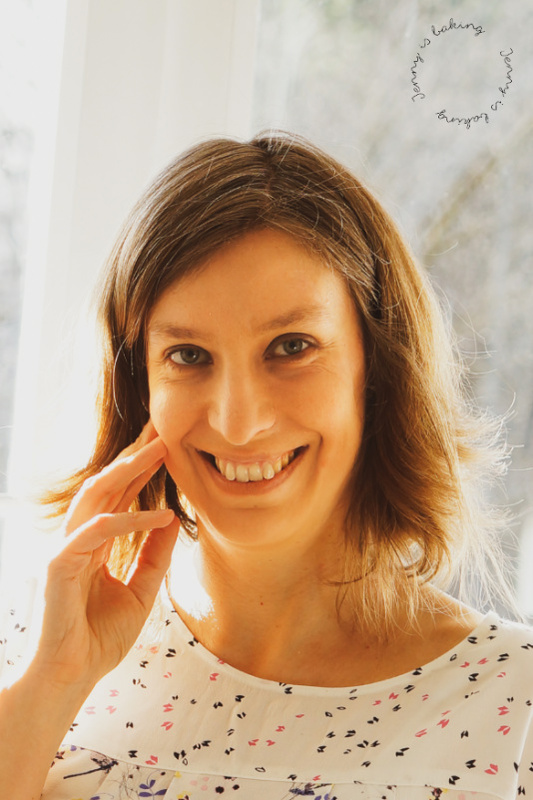 Liebe Anna, er ist ziemlich viel Arbeit, sei vorgewarnt, aber zu Ostern kann man das mal machen. Lass einfach Rosmarin weg, der Apfelkuchen schmeckt auch so!